A few weeks ago one of my good friends was visiting from out of town (Hi Melly!). We used to be roommates and brunch was a fairly regular thing in our house. It was also the birthday for one of our mutual friends (Hi Liz!). I promised them both a yummy brunch dish. I wanted to do something simple given that I knew we were going to be out late the night before, so I settled on french toast. If done correctly, it is one of my favorite brunch foods. 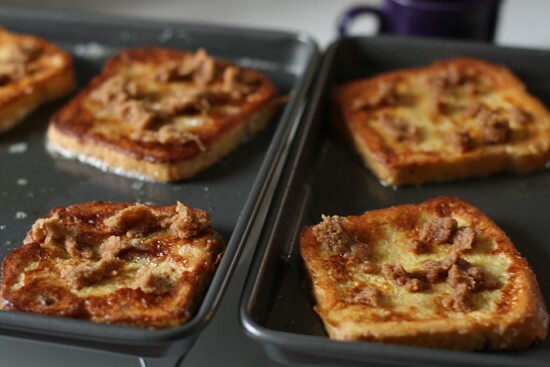 What is hard to see in the above photo is the thin layer of caramelized brown sugar topping on each piece of toast. 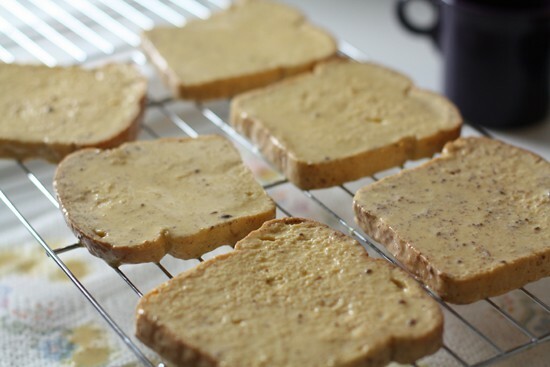 It gives them a bit of a crunchy top but the rest of the toast is rich with custardy goodness. 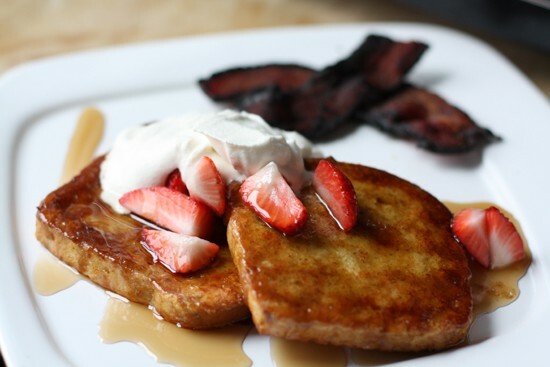 The only thing better than French toast for breakfast is caramelized French toast for breakfast. Proven fact. 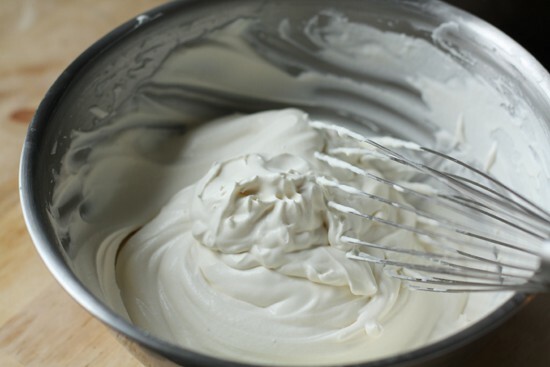 1) For the whipped cream, add all ingredients to a mixing bowl (preferably metal) and whisk like crazy until it holds peaks, about 2-3 minutes if you are good. 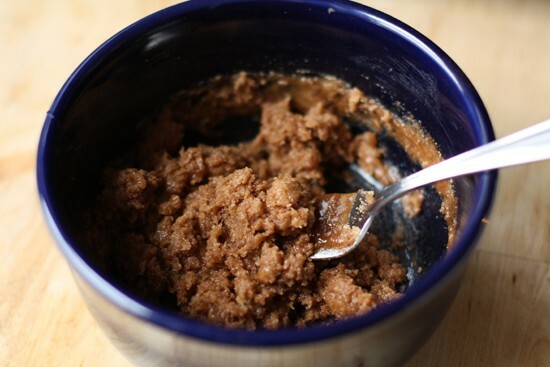 2) In a small bowl, stir together the brown sugar, syrup, and cinnamon in a small bowl. 3) Preheat oven to 300 degrees F. Add your bread to a few baking sheets and bake the bread for about 10 minutes until they are fairly crispy. You don’t want them browned really, but just dry. 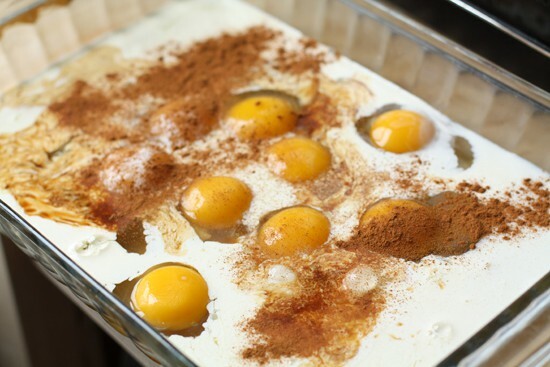 4) Whisk together eggs, half and half, cinnamon, vanilla, lemon juice, and a pinch of salt in a large baking dish. Whisk well. 5) Once your bread is dried (and cooled) set it in the custard mixture and let them soak up as much custard as possible. 10 seconds per side should do the trick. They should get soggy, but still hold together if you have good bread. 6) Let these pieces rest for a few minutes on a cooling rack. This will let the excess custard mixture drip off and also give the bread time to really absorb the mixture that is there. Preheat oven to 450 degrees F.
7) IN a baking sheet, pour 1/4 Cup vegetable oil. Swirl it around and put it in the oven to heat up for about 4 minutes. Once the oil is hot, lay your french toast right on the pan. I was able to fit 6 pieces per pan. It will sizzle and hiss and that’s good. Then back in the oven for 8 minutes or until the bottom sides are well browned. 8) Take them out and flip them over. Once you flip the pieces then sprinkle about 1 Tablespoon of the brown sugar topping on each piece. Don’t worry about lumps or if it is uneven. When it melts it will spread out. 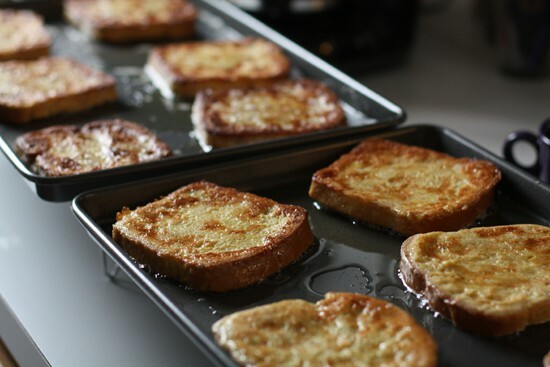 9) Back in the oven for another 6 minutes and you should have lovely oven baked french toast. Keep a close eye on it the second time around as the brown sugar can go from perfect to burned in about 30 seconds. 10) Let it cool for a few minutes before eating. 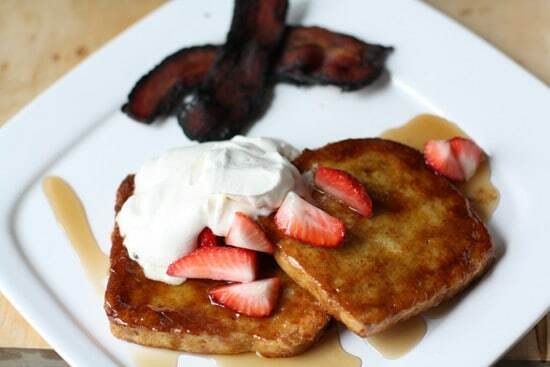 I served these with the whipped cream, syrup and some fresh strawberries. Recipe from Best of America's Test Kitchen. Mix this all together in a bowl and whisk it furiously for a few minutes depending on the furiousness of your whisking. Homemade whipped cream is a staple at my brunches. Also, mix together the last three ingredients on the french toast list (brown sugar, syrup, cinnamon) in a bowl. This will be the topping that we put on at the end. It should be pretty thick and have the consistency of wet sand. Brown sugar. You DO make me feel so good. Next, put all of your white bread in the oven at 300 degrees for 8 -10 minutes a side or until they are fairly crisp. You don’t want to brown them, but get out as much moisture as possible. Keep a close eye on them as you don’t want toast just yet. You just want dry bread. Meanwhile, combine your eggs, half and half, cinnamon, vanilla, lemon juice, and salt in a large baking dish. Stir it up well. This is not stirred up. Once your bread is dried (and cooled!) set the bread slices in the custard mixture and let them absorb as much of it as possible. It should be okay to leave them in the mixture for 15 or 20 seconds a side. They should get soggy, but still be together. If they fall apart then either they were not dry enough or you bought really bad bread. If done correctly though, your pieces will be very moist but still a piece of bread. Next is a very important step. Let these pieces rest for a few minutes on a cooling rack. This will let the excess custard mixture drip off and also give the bread time to really absorb the mixture that is there. Meanwhile you can crank your oven up to 450. One problem I have with the traditional way to make french toast is that you can only make a few pieces at a time if you are using a pan. If you have a griddle than you can do more I guess. The method that they use in this book though is amazing. Get a baking sheet and pour 1/4 Cup vegetable oil in it. Swirl it around and put it in the oven to heat up for about 4 minutes. Once the oil is hot, lay your french toast right on the pan. I was able to fit 6 pieces per pan. It will sizzle and hiss and that’s good. Then back in the oven for 8-10 minutes or until the bottom sides are well browned. Take them out and flip them over. How to cook 12 pieces of french toast all at once. Depending on your oven, you might have to move the trays around from top to bottom to get even cooking on both trays. I rotated mine after 4 minutes. Once you flip the pieces then sprinkle about 1 Tablespoon of the brown sugar topping on each piece. Don’t worry about lumps or if it is uneven. When it melts it will spread out. This just kicks it up a notch. Back in the oven for another 6 minutes and you should have lovely oven baked french toast. Keep a close eye on it the second time around as the brown sugar can go from perfect to burned in about 30 seconds. Let it cool for a few minutes before eating. I served these with the whipped cream, syrup and some fresh strawberries. A good way to start the day no doubt. I must say I was very impressed by the method of making these guys. The brown sugar caramelized perfectly and they were easy to cook. The one criticism I would have about the method is that it does leave you with a pile of dishes. The way I’ve made french toast in the past, you just have a pan and a bowl. Now I have to clean baking sheets, cooling racks, bowls, and other random things. Not a big deal though and worth the extra work in my opinion. Give this a shot if you are looking for a new french toast recipe! I couldn't help but notice there are like 12 pieces of French toast up there. Who did you possibly feed all of this ridiculousness to? this looks fantastic! I've never seen that method for french toast before. And is that extra dark bacon I see back there? Niiiice.